This week Sunday Supper is celebrating our hometowns by cooking up dishes that evoke those feelings of nostalgia and love for our good ol' stomping grounds! My "original" hometown is not Seattle. I was raised a Southern California girl. But, as I have lived here for 8 years now, Seattle(ish) has become home to me. I used to miss the beaches and perpetual sunny days when I first moved to Western Washington, but now I revel in the lush green surroundings that are provided by those rainy Washington days. And before it seems that I am trying to say is Seattle = rain, can I just tell you that the summers I have spent here are some of the most glorious summers of my life? I do have to admit though, that I fell in love with the food before I fell in love with the scenery. While my mind still pined away for the sunny So Cal beaches, my tummy fell head over heels in love with the Seattle food scene. I was never really a big seafood girl when I lived in San Diego. Seafood uummm. I mean it is a coastal city, but the seafood was just never a big deal. I think the only "seafood" I really ate was fried fish or shrimp, and the only fish I had cooked with was tilapia. Then I move to the Seattle area, hellooooo fresh seafood! It is known for its salmon, clams, oysters, etc. But it was the Dungeness crab that I fell in love with. Oh, don't me wrong, I loves me some fresh salmon and I learned to love something I nevvvvvvvvvvvvver thought I would.....raw oysters! The thought of that before I moved here made me shudder. But now I will gladly slurp from freshly shucked oysters with you any time! Let me return to my lovely crustaceans. Dungeness, or dungies as they are called here, have such delicate sweet meat. Oh my, it is just heaven! Then when I heard about this weeks "Hometown Food" theme I thought long and hard about what I wanted to make. I knew it would be crab, but I wanted to do something new. That was when it hit me. New England has its lobster rolls, why can't Seattle have its own roll? There is no reason why not. And at that moment I took it upon myself to create this tasty little hometown treat. Well, the result is a wonderful sandwich that revels in the true flavors of the Dungeness crab, with little muss and fuss. I could seriously eat buckets of this stuff and, I am pretty sure, you will feel the same way!! 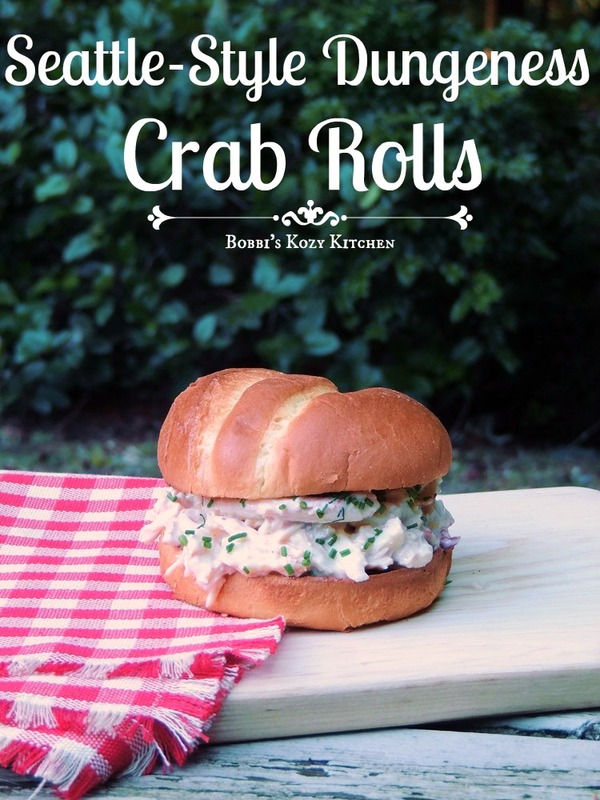 So, celebrate Seattle with me by whipping up a few of these fabulous crab rolls, and then hold them high with me. In a medium bowl, mix the mayonnaise, paprika, dry mustard, lemon zest, lemon juice in a small bowl. Season with salt and white pepper. Gently fold in the crab. Butter the buns and toast under the broiler until golden brown. Spoon half of the crab mixture on to each bun and top with chopped chives. Like what you see? Let's stay connected! When I first saw your recipe title I thought it would be a type of sushi roll. But then, oh wow!, what a sandwich. Total yum! Ohhhh I am drooling here! I love crab salad!!! I love a creamy crab salad -- and this sandwich is perfection! YUMMY! Me too Val! I am so glad you like it!! What?! No seafood in San Diego? What about those famous fish tacos? It doesn't matter because this crab roll looks delicious. Oh I wasn't really thinking about those as seafood LOL but yes fish tacos rock!! I remember driving down to Washington state to chow down on crab---so marvelous! Your crab roll has my mouth watering. SO yummy! You may very well have just started a whole new thing with this crab sammy!! Fantastic! I would totally love one of these sandwiches! I have always wanted to live in SoCal, but I often wondered about Seattle. I think I might be happy in either place. It was a hard adjustment for me Laura, but now I love it!! Sign me up for one of those Seattle Rolls... Your crab roll sounds delicious! OMG, dungies are the best thing EVER!!! I finally found a market where I can usually find them here on the east coast. I know I'm *supposed* to defend our blue crabs, but come on. I just can't. I love that you made a sandwich with the beautiful dungies! I'll have to try it now that I know I can get the crabs in the first place. Looks so awesome! Ooohhh yes yes yes! If you can get dungies you have GOT to make these babies! Huzzah to you for creating this luscious sandwich. My mouth is watering!! Yes please. I haven't had crab, shrimp or any lobster salad in YEARS! I think I need to change that with this recipe. This sandwich looks absolutely beautiful! I was there a few years ago and the seafood is amazing. We drove down the coastline and it was absolutely beautiful. I can't wait to come back! I would love to do that drive someday. Maybe we will go visit San Diego. Your so right about the summers here! I think it's the only thing that gets me through the winter! This Crab Roll is screaming my name! Going on my to make list! I didn't know you were local Serena :) Yes yes, please give these a try! !